First, let me tell you about the Powder Day e-book. I’m so excited to be releasing my first collection of patterns. The book was released today with just the Fernie Hat, at a reduced price. As the other patterns get released (between now and January), the book will get updated. Buyers will get an updated version emailed to them each time an update comes out. Early buyers get the book at the seriously great price of $7. Each time a new pattern is added, the price goes up, so it will be $9 after the 2nd pattern is out, then $11 when the 3rd pattern is added, and then it will be the final price of $14 when all 4 patterns are there. And since you can already see what you’re getting, what have you got to lose? 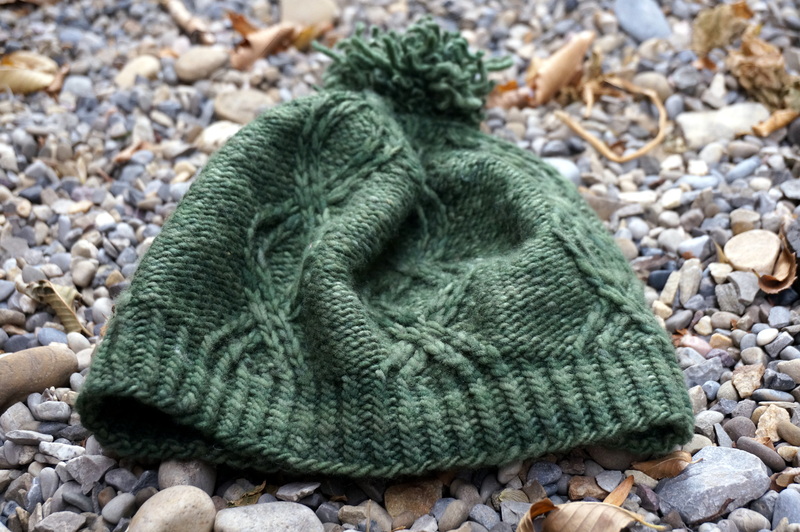 And with the release of the e-book today also came the Fernie Hat, the first pattern in the collection. The Fernie Hat features the figure-eight cable on a reverse stockinette stitch background. It starts with a twisted rib brim, which evolves into a set of 6 cables that eventually taper to the top. It’s finished off with a funky pompom, as all hats should be! If you’re interested in just the hat then it’s available as an instant download on Ravelry for $5. Once again, thank you to Eleanor Dixon for technical editing and to all of my testers for being the best group yet! And I can’t say enough of a thank you to my beautiful friend and model Tamara, who taught me to knit all those years ago! Thanks Jo! We were just in Fernie this summer on our way to Idaho, though I haven’t skied there in years. I’m working on teaching the kids to ski so I can get back at it.